Recruitment frequency of Prosopis cinerariain the United Arab Emirates is poorly understood, though heavy browsing by camels is often assumed to be a limiting factor. 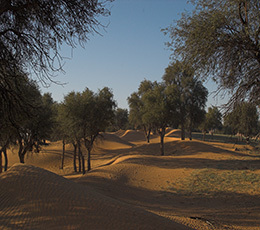 Macromorphological characteristics were recorded at eight locations from the northern United Arab Emirates. Tree size (canopy diameter, trunk diameter, and tree height) showed conformity within locations. Height of browse line was strongly affected by camels, which removed foliage to a height of 3 meters whenever present. Recruitment by seed was not observed during the study, and observed asexual recruitment was limited to root suckers produced only within the season. Presence of suckers was unrelated to browsing but strongly affected by a shifting ground surface. Viable theories for the absence of sexual recruitment include seedling destruction by herbivores, a lack of safe sites for seedling growth and establishment, and that sexual recruitment events might naturally occur rarely, but produce many recruits in the rare successful seasons. Significant recruitment of new individuals is likely to occur only with protection from current herbivory systems.